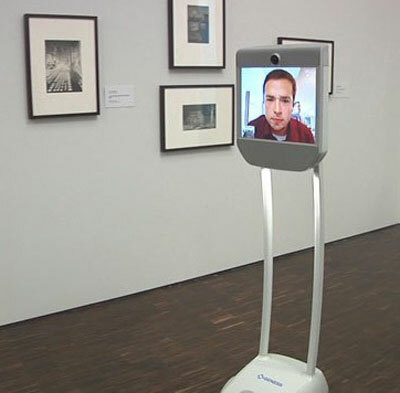 People who have never before been able to tour the Figge Art Museum in Davenport can now do so with the help of a high-tech robot. “Genie” is a camera and TV screen on wheels that can be controlled remotely by someone with wifi and a computer. Tim Schiffer, the museum’s executive director, says Genie is designed to open doors for people with disabilities or who are homebound. This style of robot is already being used by art museums in San Francisco and Detroit. 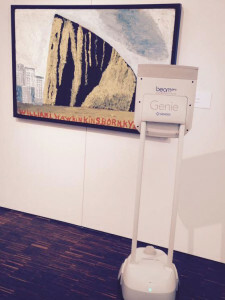 Schiffer calls Genie a sort of “Skype on wheels.” It puts the camera and screen on a mobile platform which enables anyone with an internet connection to tour the art museum. Genie robot during a tour of the Figgie Museum. Genie is being made possible by a partnership with Davenport’s Genesis Health System. The robot will provide remote tours to Genesis hospital patients initially, eventually expanding to include senior living residents, school groups, and people who are homebound.